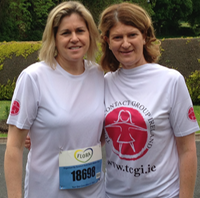 If you are planning to do the 2019 Women's Mini Marathon in Dublin for TCGI, remember to register HERE before 2nd May. It’s one of our biggest fundraisers so we appreciate everyone’s support. The members of TCGI have offered a wealth of support for over 25 years. We understand that every person’s needs are unique as Turner Syndrome affects each girl and woman in a different way. In brief, you should know the following about us: our organisation was established in 1991 and has been responsible for providing outstanding information, resources and support for those affected by Turner Syndrome ever since. If you are not familiar with our organisation and your first contact with us is online, we would be pleased to hear from you! Please let us know what your needs and questions are, we will be more than happy to help. You can reach us at 1890 815 667 for the price of a local call. We are looking forward to hearing from you. You can also contact us at our e-mail address: info@tcgi.ie. We would like to acknowledge and thank our sponsors Merck Serono, Novo Nordisk and Pfizer without whose support our group could not continue.